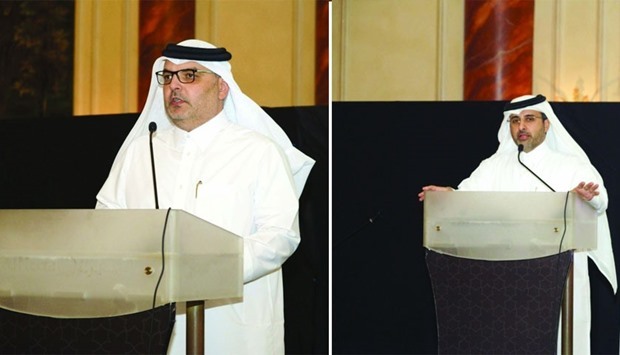 Dr Saad al-Muhannadi, Qatar Rail chief executive officer (L) and Abdulla Abdulaziz al-Subaie, Qatar Rail managing director and chairman of the Executive Committee (R) speak at the event. Doha Metro project will achieve 70% “project progress rate” next year, Qatar Rail announced on Sunday. 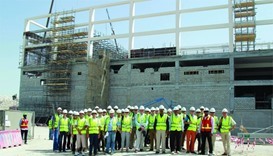 As many as 37 stations of the Doha Metro project are under construction with more than 41,000 workers on site. 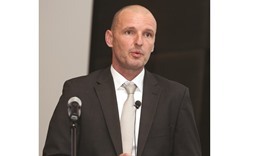 The metro project has so far worked a total of 202mn man hours and achieved one of the lowest accident frequency rates (AFR) in construction in the world, Qatar Rail said at its third all-staff town hall meeting attended by management and employees. At the event, Qatar Rail highlighted the achievements of the last 12 months and looked forward to the milestones expected next year. 2016 witnessed a few significant milestones; Qatar Rail said and cited the recent completion of viaducts on the Doha Metro project. A few months earlier the company celebrated the completion of all tunneling works. 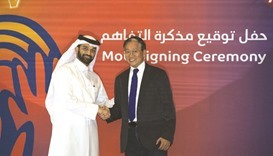 Next year’s other milestones expected for the Doha Metro project are the arrival of the first four trains in Doha, dynamic testing of the first train in Japan, awarding the rail and “FM operator” contracts, as well as advancement of operational readiness preparations and the development of revenue generating capabilities. Inaugurating the town hall meeting by launching the Business Transformation Programme, Abdulla Abdulaziz al-Subaie, Qatar Rail managing director and chairman of the executive committee said, “We are about to embark on the most critical phase of the Rail Development Programme; we will be soon transitioning from a rail developer to a rail operator. We have launched a Business Transformation Programme that rests on four pillars- delivery of the programme on time, budget and quality, financial and operational sustainability, organisational efficiency and building Qatari capabilities. During the open forum with staff, al- Subaie outlined the detailed objectives of the Business Transformation Programme, the execution strategy and the various initiatives and targeted completion timelines necessary to achieve this transformation. Qatar Rail’s strategies centre on headway progress toward the completion of the Doha Metro, the Lusail Light Rail (LRT) and the Long Distance Rail projects. Anchoring this progress, the Doha Metro works are advancing as scheduled for a first-phase operational launch by 2020 involving three lines - Red, Green and Gold. Dr Saad al-Muhannadi, Qatar Rail chief executive officer praised the company’s on-site achievements and transparent processes delivering progress for its projects. “Qatar Rail is moving at a very quick pace consistently adapting and allocating its talents, resources and partnerships within the timeline and budget provisions to achieve progress across all its landmark projects. At the centre of its progress during 2016, the Doha Metro project achieved several milestones, starting with the completion of 100% of all tunneling works, awarding all MEP subcontracts, with overall station completion progress reaching 46%. Building on the milestones for 2016, Qatar Rail has set ambitious goals for 2017 that will focus on its continuous, timely and cost-effective project completion. The construction focus has now shifted to the more complex phase of installing tracks and the railway control systems, as well as the installation of mechanical and electrical plant and equipment, and carrying out architectural fit-outs. It is expected that the track installation works will be completed by end-2017. On top of its priorities, Qatar Rail is also focusing on the development of a long-term business development strategy that involves property development and retail and advertising to achieve operational and financial sustainability. In collaboration with the Ministry of Transport and Communications, works on the implementation of transport demand management measures to support the integration of the different public transport systems and the safe and efficient interchange with other travel modes are also in progress.